The processes of thermal oxidation and carbonization of copolyamide benzimidazole (CPB) fibers were investigated, structural and chemical transformations were characterized by thermogravimetry, IR spectroscopy, elemental analysis, atomic force microscopy, and physicomechanical and electrophysical properties. Fiber hardening was found to occur on treatment at low-temperatures in air. It was shown that the preliminary oxidation of CPB fibers has practically no effect on the carbonization of the polymer. Impedance studies have confirmed that structural chemical modification leads to a decrease in the active resistance of the polymer fiber. Translated from Khimicheskie Volokna, No. 4, pp. 103 – 108, July – August 2018. 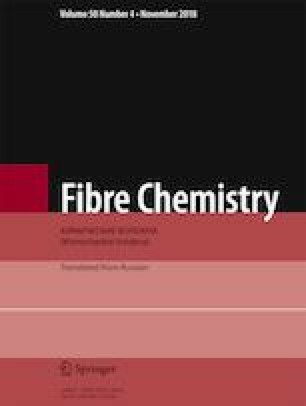 The authors express sincere gratitude to Dr. Alexandra Vasil’evna Volokhina, Doctor of Technical Sciences, for providing fiber samples.